Set in WW2. Ada (10) lives in London with her cruel mother and little brother. She has an untreated clubfoot for which her mother has restricted her to their flat her whole life, seeing the world through a window. When her brother is to be evacuated she decides she has to go with him. They duly escape and are sent to a rural village, and the care of Miss Susan Smith, who at first refuses to take them but there are no other options. She does her best but struggles with Ada, as the girl's past experiences leave her unable to trust and to mistrust any kindness done for her, expecting rejection at every turn. Ada's lack of knowledge about the world is astonishing (if a little unbelievable, though I appreciate the idea) - even grass is new to her. She does have a huge dose of determination, and it is the process of her learning to live and to feel love and joy, which is at the heart of the story. Teaching herself to ride Butter, Miss Smith's neglected pony, plays a big part, assisted by the gentle teaching given her by the groomsman from a nearby estate. Ada's progress is matched by Susan Smith's growing love for the children until the dreaded reappearance of their mother, leading to some heart wrenching concluding scenes. 9 - adult. 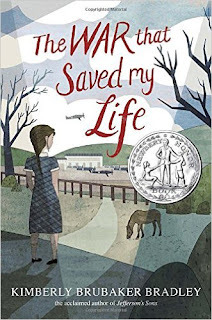 I loved this to bits, in spite of some improbable moments, and so did others - gaining it best-seller status, a Newbery Honor, and the Schneider Family Award for a book that embodies an artistic expression of the disability experience for child and adolescent audiences.